You'll love staying at this house and now it is more affordable than ever. This 3BR/2.5BA modern designer space offers the complete Austin experience. Antique brick walkways and lighted landscaping lead to the house that offers three levels of living space and a fantastic rooftop deck overlooking the city. The house is just one mile from the Lady Bird Lake hike & bike trails and is within walking distance to all of the East Side’s premiere venues. You are a short 3-minute walk to local pubs, coffee shops, and a convenient store. Not to mention, our home is a 15 minute walk to East Austin Nightlife: White Horse,Volstead Lounge and Eastside Showroom. You are sure to enjoy all that Austin has to offer! Hardwood and artistic concrete grace the floors of this one-of-a-kind house. The master suite features a private entrance and a tranquil master bathroom complete with a great bathtub and a dual shower system. The second floor has an open kitchen and living room floor plan with a modern stainless steel kitchen. The living room includes a 55"" LCD TV, an XBox360, SiriusXM, and Playstation Vue for streaming services. Plus there is Wi-Fi available throughout the home. Also upstairs are an entertainment system, dining table, and half bathroom. The house has a security system and an in-unit washer and dryer. 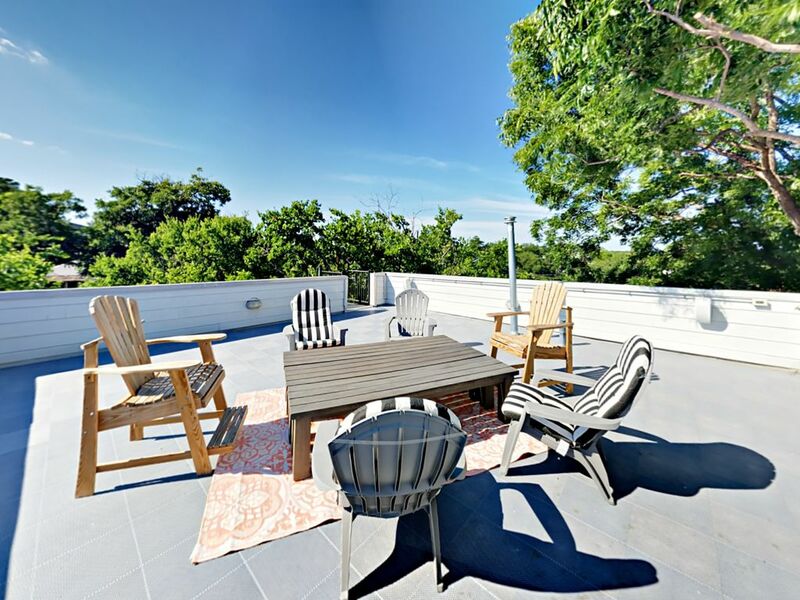 The kitchen opens to the delightful outside deck which hosts a propane grill and a custom spiral staircase leading up to the rooftop offering spectacular views of the downtown Austin skyline. A fenced-in yard and locking gates surround the property which gladly welcomes pets. The heart of downtown Austin and the UT football field at Darrell Royal Stadium are only two miles away from the house. The Airport Flyer bus stop is located just blocks away and takes you directly to Austin Bergstrom International Air Port within 10 minutes. Our property is TurnKey Rental Certified. All photos and amenities have been verified by TurnKey staff. Our calendar and rates are 100% accurate. We strive to make it as easy as possible to stay at our property - you just drive right up and enter via our secure electronic lock. No more keys and no more security concerns with a unique code that works for your reservation only. We will notify you proactively when early check-in / late check-outs are possible and you'll receive the comforts of a luxury home when you arrive like a starter supply of shampoo, soaps, paper products and hotel-quality towels and linens. In addition, when you book we will send you our mobile app with property directions, details, unlock code and instructions. And if you need us, we are available 24 hours each day with live help. TurnKey Vacation Rentals uses the industry's most trusted brand of software to securely store all guest data - HomeAway Software for Professionals. All TurnKey Vacation Rentals follow local and state tax rules. Each reservation includes applicable taxes, a cleaning fee and a Property Damage Protection Program. Love this location, very close to family! Not sure what is up with the noise complaints because we were never loud?? That was very frustrating!!! Great place to stay for the price. Easy to find some restaurants and bars in walking distance as well. Smart TV and Xbox made it easy to entertain and relax. I would definitely stay here again. Had 8 folks stay here comfortably! We had a great time.. Especially loved the rooftop bar and surrounding neighborhood!! When you drive up to the house, the neighborhood seems a little sketch, but it's really not. The house is really close to great bars and restaurants and a very quick ride to downtown. The house itself has a lot of charm and character and great outdoor areas. We loved the setup of the house as well as the many outside seating areas. We would have liked a little more room for cots and air matresses. House was well stocked with toiletries, towels, dishes, etc. House was a bit dirty when we arrived and we took videos to insure there was an extra charges for cleanup that we weren't responsible for. The house is situated near all of the neighborhood comforts, such as the East Village Café, Gourmands Neighborhood Pub, Joe's Bakery & Mexican Food, and the Bread Basket food mart just steps away. The #4 bus stop is a half block from the property and will transport guests to their destinations in minutes. The UT Football at Darrell Royal Stadium is only a 2 miles away. The Airport Flyer bus stop is located just blocks away and takes you directly to Austin Bergstrom International Air Port within 10 minutes.